Back stitch is a simple and very useful stitch, especially useful for seams in crochet and other projects. It is a very strong stitch. As it's name suggests you go 'back' over ground you've already covered with the stitch which gives added strength. It's particulary good for areas in which you don't want too much stretch, like shoulder seams, but if you don't work it close to the edge of your project you can end up with a lumpy seam, so be careful. Thread your needle with the yarn or thread you want to use for your seam. You will be working your seam right to left. Hold or pin your project pieces together (right sides together) and weave in your yarn along the very edge of your seam area (left to right) , then take a stitch around both layers of the edge to secure your yarn - never start with a knot, as it can sometimes slip through your work and is less professional looking. At the far right of your work push your needle through from front to back, then push your needle back through to the front about a quarter inch along. Pull your needle and yarn through to the front. Go back to where you first pushed your needle through front to back and push your needle into the same spot. This time go along behind your work about a half inch and push your needle back through to the front again pulling your yarn through too. Go back to the end of your last stitch and push your needle into that spot. Go along behind your work for a half inch and push your needle through to the front again. Repeat step 5 and you're working back stitch. When you reach the end of your seam work the last stitch twice. Then on the side facing you slide your needle under the last double stitch, pulling your yarn right through (twice). Then work your needle back along the seam under each of the last few stitches and pull your yarn through. 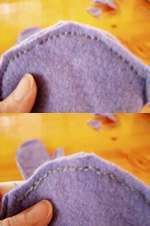 Stretch your seam then trim off the end. Simple? Of course. I used a 'half inch' stitch as an example. In reality back stitch can be worked in any length. Use a back stitch length appropriate to your project. If you have a project in bulky yarn, your stitch should be longer. Finer yarn work should have a shorter stitch length or it can end up too open. Back stitch can also be used as a decorative stitch - use it as flower stems or an outline around a picture, shape or figure to give definition. Check out these methods of crocheting seams. Have you see all these different edgings you can crochet?